Most parents, as they watch their babies develop the first couple years of life, get great joy out of seeing their child reach all the milestones – reaching, rolling, sitting, crawling, standing, walking. These happen at a fairly normal pace and we anticipate them eagerly! I know I watched with pride as our first son, Parker, rolled around 5 months, sat up around 6 months, crawled and pulled to standing by 8 months, and walked by 11 months. We then watched incredulously as Max, our second son, tried to keep up with his big brother by accelerating the pace: rolled by 4 months, sat up by 6 months, scooted around and pulled to standing by 7 months, and took his first steps before 10 months of age. Now, we see different milestones. Sure, we are still working towards the big ones, but because those milestones are more difficult to come by, because the challenge is that much greater (as is the pride! ), we are far more observant of the little intricacies that need to happen to get to the next step. 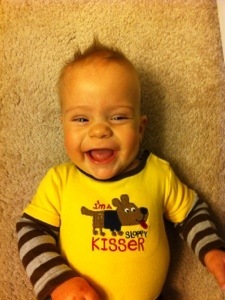 Today while on the floor with Colten (almost 7.5 months), I had him propped up in a seated position. He has improved his stability so much over the past couple weeks and works so hard at keeping himself upright. He did his best when he had a smaller toy in his hands that he could put in his mouth; it was almost like he was so focused on that object he forgot he was sitting! Our challenge is to get him to be a more sturdy base for himself – to figure out how to use both his arms and legs to keep his torso upright. Previously, he would start to lean and just topple. He never lasted long sitting and seemed to have no use of his legs to help counter-balance a tip. Now he’s getting there. We see the little movements in his legs as his body goes to one side. 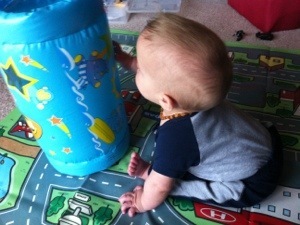 And today, he even used one hand to put down on the ground for support as the other reached up for a toy! It sounds so simple, so easy, so mundane. These are the little steps that I never saw with the other boys – we didn’t need to see them. It’s so fascinating to see how the milestones unfold at this pace. Sure, it would be awesome if Colten didn’t have to work so hard at these things. If they just came about without much intervention – I certainly don’t remember working with the other boys on these skills! But we have on average two appointments each week with therapists that remind us he is working very hard at the little things he needs to master. And eventually, those little things will build up into the great milestones. So we have a greater number of mini-milestones we work on that lead to greater rewards at the major milestones. So props to Colten for using his hand today to support himself while sitting and playing! We are learning through all of this that it’s not about how quickly a child accomplishes any milestone. It’s about how they master the skill and all the details along the way. It’s about feeling proud of each success and allowing Colten to make his own milestone development timeline. It’s about making sure Colten succeeds in using his body and mind to the best of his ability. Want me to be even more cliche? It’s about the journey, not the destination… And we’ll get there when we get there. 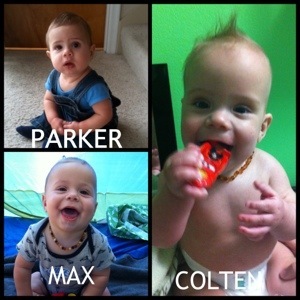 And for the curious minds, Colten’s development is not too far off yet. He rolled a couple times by 7 months and continues to work hard each time he rolls (rare, once or twice a day). He prop sits and needs constant supervision in that position still. The biggest gap for him is weight-baring. A typically-developing child, when held under their arms and placed on a hard surfact, will push through his/her legs to “stand up”. Our older sons did this by 2-3 months of age and by 7 months were standing up while holding onto a couch or stool. Colten rarely bares weight through his legs at all. We have to stand him up and lean him into his heels a bit to get his legs to lock up and bare weight. Even then he will only engage for a few seconds then he just lets his legs collapse down. So we realize that will delay some of the big motor skills like crawling, standing and walking. But we’ll get there. When he is good and ready! This entry was tagged child development, Infant development, motor skills, myelomeningocele, spina bifida. Bookmark the permalink. What a journey …………. all that we take for granted ………… this little guy has to work harder…… but with his Brothers, Mom, and Dad, he’s gonna beat the odds. Love all the pictures, Katie. Hugs to all of you. Good for Colten. He is coming along well with every improvemnt he makes. God Bless him and let him learn more things to do better everyday.